These are first try versions of the serious recordings of the songs for Predator, and its actually striking how little they changed from the 4-track versions. These were also for practice as recording because I was pretty new at it and I had only been using the 8-track for a few weeks at the time, this was the first serious project I attempted. 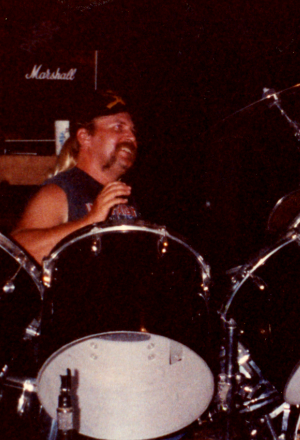 The drum sound improved greatly on the final album, and Chuck’s style improved immensely as well on the final versions. While Curt’s final versions are smoother, you can hear that he composed his leads early and basically stuck to those arrangements on the final versions. The worst thing about all these, as on the album, are the truly horrible vocals. At this juncture I was double tracking myself singing a double lead vocal harmony, which is mostly in key, other than when I try to go outside my range, but the tone and timbre is just terrible. My voice improved greatly by the next album, and I learned how to sing. Here I am yelling and screaming. The effects are primitive and uneven, some stuff is too dry and some too wet, but again, these were demos and some of these are actually test mixdowns and never intended as best versions, but they are all that is left, so take them for what they are worth. Again, all this stuff is just for people interested in the process, the quality of both the recordings and the performances doesn’t warrant repeated listenings for pleasure, they are merely historical files, documenting the atrocities. This set includes Chuck’s single-bass version of Fear No Man. Some serious screaming going on during the bridge. Traveller is an early extravaganza of mine, I was a guitar player first and I still liked to keep my hand in and there are some decent solos here, although Curt played them on the final version, I did the harmony guitars which I now think are much weaker than the solos I did here. Still, it was development piece and later I executed that type of thing much better. This is a 3 piece version with just Curt on guitar. The other major difference is this one doesn’t have a big ending, which we started doing later when Mark joined the band for a short time. None of the other versions differ materially from the final released versions, just some minor changes in solos and melody, but the final arrangements are pretty much on. Curt does a really smoking lead on Running Blind I wish he had done on the final instead of my lame one. The last 3 tracks were actually taped during the Predator sessions, but since the songs ended up on Malicious Intent, for organizational reasons I’m putting them here. The Blood Money/Judas demos I did myself of course, with a drum loop from a different song I used for a guide track. 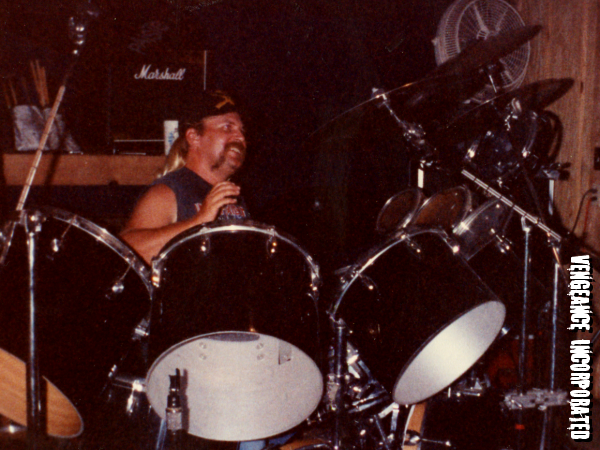 I believe that is Dave, Curt’s brother and our drummer before Chuck on the Blood Money demo. The backing vocals sound pretty cool and actually I wish I had stuck to this concept when we did the final version.